March 17, 2011 - The Sikorsky Aircraft Corp. X2 Technology demonstrator team has been named the winner of the 2010 Robert J. Collier Trophy, awarded annually to recognize the greatest achievements in aeronautics or astronautics in America. It is the 100th Collier Trophy to be awarded since the inception of the prize. Sikorsky is a subsidiary of United Technologies Corp. The recognition comes six months after the X2 Technology demonstrator successfully achieved a speed of 250 knots true air speed in level flight, setting an unofficial speed record for a helicopter and accomplishing the program?s ultimate speed milestone. The Collier Trophy will be formally presented at the Annual Collier Dinner to be held on May 5 at the Crystal Gateway Marriott in Arlington, Va.
?This is a tremendous honor that recognizes the hard work, dedication, skill and vision of many people,? said Sikorsky President Jeffrey P. Pino. ?Sikorsky has a long and storied history of innovation, starting with the invention of the world?s first practical helicopter and continuing today with X2 Technology and the exciting new possibilities it opens for our company and our industry.? Robert J. Collier was an aviator, humanitarian, and sportsman who commissioned the trophy that bears his name in 1910 with the intent to encourage the American aviation community to strive for excellence and achievement in aeronautic development, according to the National Aeronautic Association web site. Previous Collier Trophy winners comprise a veritable ?Who?s Who? of aviation excellence including Orville Wright, Chuck Yeager, and the F-22 Raptor Team. Among the Collier committee members to interview Sikorsky X2 team members earlier this week about the demonstrator?s accomplishments was American astronaut Neil Armstrong. ?The entire Sikorsky Aircraft team is thrilled that the Collier Trophy committee has recognized the X2 Technology demonstrator for its game-changing technology, putting us in the highly respected company of some of the industry?s most prominent pioneers,? said Mark Miller, Sikorsky vice president of research & engineering. ?This is a tremendous honor for the entire Sikorsky community, and we are proud to see the X2 Technology demonstrator earn its place in aviation history.? ?As the X2 Technology program transitions to its first application, we are confident that the X2? design has a tremendous future and is scalable for a variety of rotorcraft sizes and applications. This recognition is warm acknowledgement of the great things that can be achieved when the spirit of innovation and dedication to the task are the foundation,? Miller added. ?The X2 Technology demonstrator program set out to accomplish four key performance objectives: low single pilot work load, low vibration, low acoustic signature, and speed ? defined as cruise at 250 knots,? said Jim Kagdis, program manager for Sikorsky?s Advanced Programs. ?There was a fifth key objective that remains a driving force to all that we do at Sikorsky: to preserve the legacy and pioneering spirit of our company founder, Igor Sikorsky, and to educate and inspire the next generation of engineers and aviation professionals. The Collier Trophy exemplifies this fifth objective, so it is hugely rewarding for the team to stand recognized for upholding the basic tenets on which Sikorsky Aircraft was founded. I am extremely proud of the team and our accomplishment.? Among the innovative technologies the X2 Technology demonstrator employs are Fly-by-wire flight controls, Counter-rotating rigid rotor blades, Hub drag reduction, Active vibration control and Integrated auxiliary propulsion system. As a ?follow-on? to the successful X2 program, Sikorsky Aircraft is continuing development of the next-generation rotary wing technology by launching the S-97 RAIDER program. 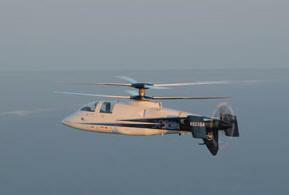 Sikorsky and select suppliers will design, build, and fly two prototype light tactical helicopters. These prototype vehicles will enable the U.S. armed forces to experience, first hand, the advanced performance capabilities X2 Technology can provide. Like the X2 Technology demonstrator, the S-97 RAIDER helicopter will feature twin coaxial counter-rotating main rotors and a pusher propeller. In addition to flying at nearly twice the speed of a conventional helicopter, the S-97 RAIDER prototype aircraft will incorporate other key performance parameters critical to combat operations ? increased maneuverability, greater endurance, and the ability to operate at high altitudes. The X2 Technology program began in 2005 when Sikorsky first committed resources and full funding for the program?s development. The X2 Technology demonstrator?s Collier Trophy award marks the second time a Sikorsky team has been awarded the esteemed trophy. In 2002, the S-92 helicopter and its program team won the award. The trophy recognized the S-92 helicopter team for designing, manufacturing, testing and introducing into service the S-92 helicopter, which raised ?across-the-board? standards for rotary wing air travel.